Meet your greeter in Rome, and board the high-speed train to Venice in 3.5 hours. This excursion will lead you into the heart of Venice and its enchanting Lagoon. We'll take you through the alley's and bridges unique aura of the floating city. Learn the fascinating history of Venice as you wander throughout this romantic maze rich in secrets and characters like Casanova or Titian. Tour the impressive St. Mark's Basilica. Enjoy your leisure time in Piazza S.Marco observing Doge's Palace architecture before boarding the next Vaporetto for a short boat ride to the Island of Murano this charming island is famous for the distinctive crafts that have been made for centuries by their resident artisans. This tour, which visits the glass-making workshops of Murano, lets you learn about the history of these generations-old crafts, meet artisans and watch them at work, and shop for unique souvenirs to bring home. Accompanying you will be an expert, English-speaking guide whose knowledge illuminates the significance of this creative outpost. Leisure time in Piazza of St. Mark's Square to sip on espresso or enjoy gelato! After meeting your group at 6:00 a.m. in Rome you board a high speed train to Venice Santa Lucia. After your guide greets you upon your arrival to Venice, you’ll board a vaporetto taking you through the Grand Canal to see some famous sites like the Rialto Bridge. Learn the fascinating history of Venice as you wander through this Romantic maze rich in secrets and characters like Casanova or Titan. Get stunned with the impressive St. Mark's Square and Basilica, as well as the elegant Doge's Palace that feature a typical Venetian style influenced by Oriental architecture. After a bit of leisure time in the Piazza San Marco for tasting an espresso or gelato. You’ll continue to your next stop Murano. Take the short vaporetto boat to Murano—a tiny island known all over the world for its exquisitely elaborate colorful and glasswork. 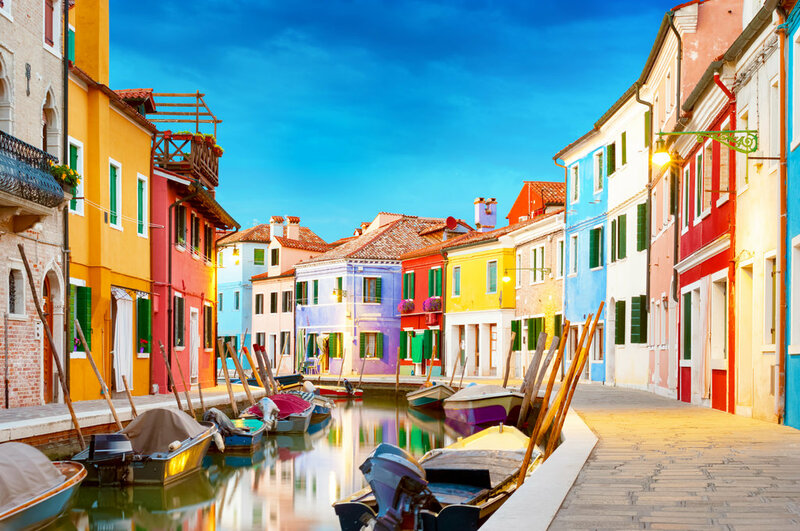 You’ll learn about the island’s history as a glassmaking enclave (which dates to the 13th century), visit an illustrious glass-making workshop, and watch a demonstration of how Murano glass is blown, colored, and shaped. You’ll also get to shop in the gallery boutique for glass pieces to bring or ship home. Your return train will depart Venice at 6:25 p.m. for your relaxing ride back to Rome Termini station around 10:00 p.m.
A Child ticket is mandatory ages from 2 to 14 years. Infants 1 year and under are free. Good walking shoes. This tour includes several sets of stairs. A hat, sunscreen, and bottled water. Many parts of the islands are not shaded.